…There are literally thousands of cheap microwaves on the market. Go into any supermarket – Tesco or Asda for example and you’ll see them all lined up in their electrical departments. You can pick one up for as little as £30. So finding a cheap microwave to buy isn’t difficult. What is difficult, however, is finding a cheap microwave that has the features you need, as well as build quality you can rely on. Now, if you’ve only got a limited amount of money to spend you can’t realistically expect a microwave to come with a whole range of auto-cook menus, sensor cooking and combination cooking features. It’s also going to be solo microwave. If you want a machine with a grill or convection oven you will have to pay more. With all that being said, it depends on what the words ‘best cheap microwave’ means to you. Cheap to one person might mean £30 but it could mean £100 to someone else. So for the purposes of this article, we’re going to give the words ‘cheap microwave’ a definition. This upper end of the price scale will get you at least some decent features. 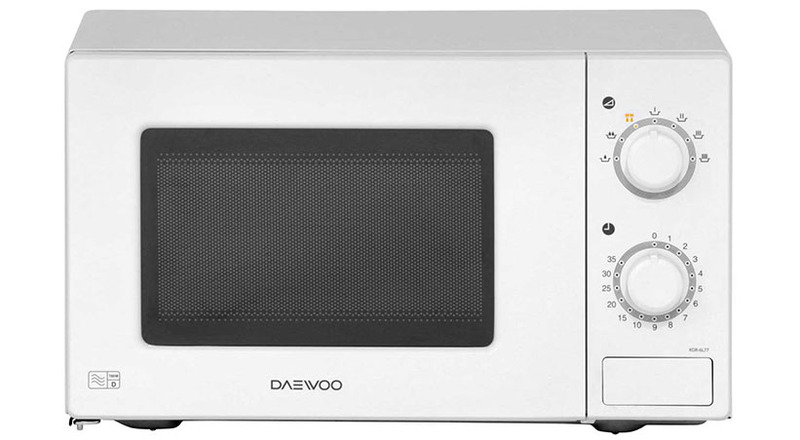 This model from Daewoo is the cheapest and most basic microwave in our list. It has a capacity of 20 litres and 5 power levels, the highest being 700 watts. It also lacks features like auto-defrost and auto-cook, you will have to do that manually. But just because it’s cheap and lacking in certain features doesn’t mean it’s no good. In fact, the things it does do, it does very well! It’s very good at heating up a meal and retaining the quality of the food, so you’ll always end up with plate of food that’s moist and tasty. The manual defrost works well too. Despite its maximum power only being 700 watts, it heats up a meal relatively quickly although it does lose a bit of power when cooking several meals in a row. The Daewoo is also Amazon’s best-seller list with a rating 0f 4.2 out of 5 stars from over 230 reviews. For just £5 more than the Daewoo (at the time of writing), the Sharp R272SLM comes with 20-litre capacity and 11 power settings, the maximum being 800 watts. To take some of the guess work out of cooking it features 8 auto-cook / defrost functions. It cooks well although some users have said it doesn’t cook as quickly as other 800 watt machines they have owned. Hardly a deal breaker! It’s an easy machine to use with simple (and very nice) touch controls. Oh, and it has a child lock too! Amazon.co.uk’s customers also seem to like it with an average review of 4.1 stars out of 5 from over 280 reviews. The Deawoo QT1 is a small, 14-litre, 600-watt microwave with 7 different power levels. It’s very simple by design with one dial for power and the time, which goes up to 35 minutes. The dual wave system cooks food evenly, although you might have to wait a little longer than you would if you had a higher powered machine. People who use the Daewoo QT1 seem to really like it, scoring it 4.4 out of 5 stars from nearly 400 reviews. This is the first of four Russell Hobbs microwaves in our review, and it’s easy to see why. Russel Hobbs is a trusted manufacturer that produces a lot of well-loved products. This model has a 17 Litre capacity with 5 power levels and a maximum power of 700 watts. 17 litres isn’t huge but it is sufficient enough to work well for a small family and can fit a standard size plate. The Russel Hobbs RHM1714B also has some of the flashier microwave features such as the auto cook setting that is pre-programmed to cook foods such as pizza, fish and popcorn hassle free. It also an auto-defrost setting that allows you to just input the weight of the food and let the microwave do all the work. One of the best-selling points of this microwave is its style. The microwave is sleek and modern, with a lovely mirror finish door and black exterior. However, this mirror finish also makes it harder to see your food when it’s cooking and quickly gets marked with fingerprints, so it may require a regular wipe down to keep it looking good. The Russel Hobbs RHM1714B is an Amazon.co.uk best seller and has 4.2 out of 5 stars from over 320 customer reviews. For our second Russell Hobbs entry we are going retro! This chic microwave comes in three colour options and keeps it simple with just two operating dials. Keeping with the retro theme the microwave doesn’t have a digital display but it will alert you with a ringer once the timer is finished. The RHMM701C has a moderate 17-lire capacity and 5 power levels supported by 700 watts. 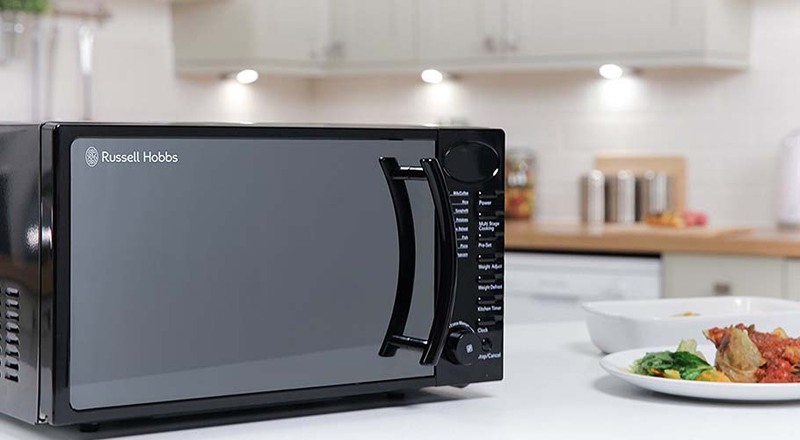 This is similar to the above microwave but unlike the previous one this does not come with a large array of features, which is to be expected with just two dials. Having said that, it is great at heating food evenly and can defrost food effectively. Meaning that it fulfills its requirements as a basic yet funky microwave. It was also given a 4.3 out of 5 stars on Amazon.com from over 360 customer reviews. The Panasonic NN-E281 is a very practical microwave that doesn’t look beautiful but it gets the job done, and done well. It has 800 watts of main power and 20 litres capacity and 5 power settings. This chunky microwave will take up a lot of space on your counter top, but its size also makes it ideal for big families. The microwave also has 9 pre-programmed settings that make cooking far easier. One of its perks is the auto defrost that works by weight, and prevents your food from beginning to cook after it has finished defrosting. It also has a handy child lock that makes it an attractive choice for parents with young children. Amazon.com gave the NN-E281 a 4.1 out of 5 stars from over 910 reviews. The third Russell Hobbs seems to be a nice combination of the two other microwaves, as it has a retro/ chic appearance but also has more features. It has an 800-watt power capability and 5 microwave power levels, as well as a 20-litre capacity. This appealing microwave also has a mirror finish design, which gives it a sleek and stylish appearance in your kitchen. The pre-programmed auto-cook options are limited but cover the basics like pizza, fish, and popcorn. This microwave also has the desirable auto defrost function and a digital clock. The Russel Hobbs RHM2064C is popular on Amazon.co.co.uk with 782 reviews giving it a 4.3 out of 5 stars. The Daewoo KOR6L15 is another microwave that’s not going to win any beauty contests, but its basic, big, and perfect for simple tasks. With its 20 litre capacity, you won’t be short on space, and it comes with the standard 5 power levels. But its 700-watt power output could mean it’s not as quick as some of the other microwave on the market. However, it does come with a dual wave system that ensures even coverage of heat, so your food isn’t left warm in some places and cold in others. This big yet basic Daewoo is ideal for someone who wants a reliable machine but also doesn’t use microwaves for much other than heating and defrosting. Amazon.com gave it 4.2 out of 5 stars from over 350 reviews. Our final Russell Hobbs microwave is very stylish, with its gloss black design that could blend into any kitchen. It has a 20-litre capacity, 5 power settings, and 800 watts of microwave power. This is another microwave with a mirror finish door that makes it look great, but can also be a pain when cooking as you can’t see the food clearly. It also has a basic digital clock and child lock for peace of mind. The limited buttons and dials give the machine a tidy minimalistic look, but it doesn’t sacrifice the basic pre-programmed auto-cook menus and auto defrost function. This minimal use of buttons and dials could make it a little confusing to use at first, but it is unlikely to take long to get to grips with. 265 people have reviewed this microwave on Amazon.com, giving it a 4.3 out of 5 stars. The Tower T24001 is basic as it only has two dials (one for heat and one for time), but it looks sophisticated and would blend well in most kitchens. It has a 20-litre capacity, a reasonable 800-watt microwave power, and has 6 strength settings. The basic set up makes it easy to navigate, so would be great for people who don’t use microwaves very often. The addition of a push button door allows for easy access instead of having to fight to door open just to look at your food. 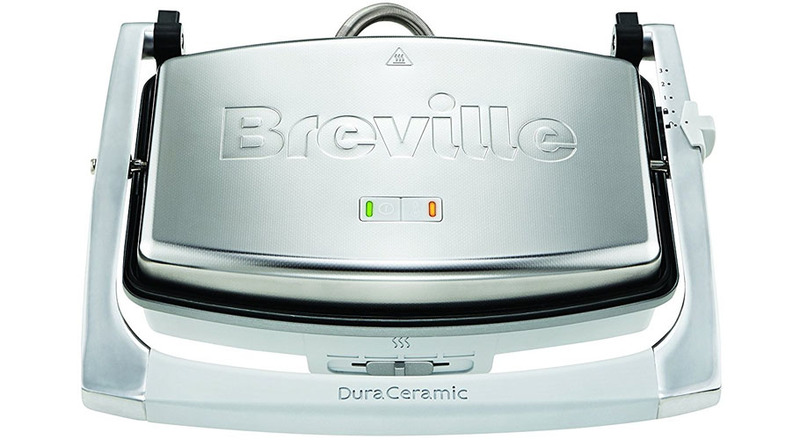 The Tower T24001 doesn’t come with any advanced features, but it heats evenly and quickly. It is also good at defrosting food, but you will need to keep an eye on the food to prevent the microwave from beginning to cook the food once it has defrosted. Amazon.com gave it a 4.3 out of 5 starts from over 100 reviews. This probably the main thing to think about. The general rule of thumb is that the bigger your family the bigger a microwave needs to be to cope with the amount of food that will be cooked in it. Likewise, if you use a microwave all the time, you might want to buy a machine with a bigger capacity. If you know you’ll only use it occasionally to warm up a bit of soup or to reheat leftovers, consider something smaller. The power of a microwave is another important factor with higher wattage machines being able to cook food more quickly and more evenly than their lower powered counterparts. If you have a large, hungry family, get something with as much power as your budgets allows. On cheapest microwaves cooking menus will be limited and although auto-defrost and auto-cook menus aren’t essential, the do take a lot of the guesswork out of cooking so they are definitely handy to have. Some basic microwaves do have them if you can stretch your budget that bit further. Super cheap microwaves (as with anything we buy) aren’t always the best idea and can present a false economy. Some really cheap microwaves just don’t work very well, cooking the outside of your food while leaving the inside frozen. This is especially true with non-branded products or big retailers own brand products. Just go to an auction house like John Pyes and you’ll see these kinds of products stacked up in the hundreds. Yes, they might come with a 12-month guarantee but do you really want to have to take it back and get a replacement? We’re not saying that more expensive products don’t develop faults, but they’re much less likely to as the companies behind them have much more robust quality care procedures in place. A microwave should last several years but really cheap ones might go faulty after only a year or two meaning you’ll have to go out and buy and new one. We’re not bashing cheap microwaves and we’re not saying you need to go out and spend hundreds of pounds on a microwave for it to be any good. There are lots of microwaves on the market and we’ve listed 10 of the best cheap microwaves in this article. What we are saying is to make sure you buy the best microwave that you can afford and to try and avoid the pitfalls of buying a machine that isn’t right for you or buying something of inferior quality when the same money could have got you something much better. If none of our best cheap microwaves suit you and you want to look elsewhere then please do but always make sure you look for reviews left by other users before making a decision to buy.